Lost in the rush of deserved praise for At the Cut, Skitter on Take-off seems to have gone largely unnoticed. That’s a shame, because the album is brilliant. 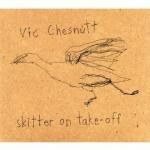 Up until a few months ago, everybody seemed to have forgotten about Vic Chesnutt. That's kind of a weird thing to say about someone that most people have never heard of, but the singer and guitarist did have a brief moment in the sun -- the indie sun, at least -- in the mid-'90s. At the Cut, released in September, garnered Chesnutt some sudden press, partly because it was a rough, uncompromisingly gut-churning album, partly because it featured Guy Picciotto and members of Godspeed You Black Emperor. Less than a month later, he dropped his follow-up, Skitter on Take-off, like a crumpled receipt fluttering out of his pocket as he reached for his wallet. Lost in the rush of deserved praise for At the Cut, Skitter on Take-off seems to have gone largely unnoticed. That’s a shame, because the album is brilliant. Where At the Cut was rich and fairly heavy, Skitter on Take-off inhabits a pervasive, haunted emptiness matched only by Smog's Bill Callahan. The entire album sounds off-handed, casual, like Chesnutt is literally making up each song as he goes along. This is underlined by the fractured poetry of his lyrics and his simple but unusual melodic sense. His melodies refuse to resolve, lingering nervously, repeating themselves, but his resigned tone, contemptuous and wounded, animates them with a cold authority. Chesnutt has an affinity for anti-romantic, even ugly turns of phrase like "I was taking little chunks of your love and squirreling them away", lines that read terribly on the page but sound uncomfortably appropriate in his ragged, tremulous voice. “Feast in the time of plague," he laments on the opener. “You were a beautiful pig." That's the despairingly practical attitude that pervades the album: mournful and lonesome but harder, wise now, and ready to move on. Skitter on Take-off makes astonishing use of silence. It's everywhere on this record, oppressively still, gathering, and Chesnutt's unadorned music, his warped guitar and thin voice are barely a candle flickering against the black. Jonathan Richman's production is brilliant, and it's hardly even there. Always a master of minimalism, he strips away every ornamentation, every unnecessary element, making the greatest use yet of Chesnutt’s oddly skeletal, almost chord-free plucking style. Richman virtually leaves the state -- Chesnutt sounds so utterly alone on the album that it's hard to believe there actually was a producer, or even another soul within a hundred miles. Outside of some distant brushed drums on a few songs and Richman's mumbled voice on the introduction to “Dimples” (an inclusion that adds to the casual, DIY spirit of the record but which ultimately damages its aesthetic of remoteness and alienation), the album is all Vic Chesnutt, a man alone, making a heartsick sound with just enough notes to be considered music. You can feel the hunger, the disquietude and unease in the small muscles of your neck. Skitter on Take-off is not a fun listen -- it's not good background music -- but it's very powerful. It takes an extraordinarily rare talent to compel and captivate with no tools, no tricks, no impressive displays. Chesnutt doesn't perform or entertain. It sounds like he made the record by mysterious compulsion and he doesn’t even know you’re listening. Skitter on Take-off is in the mode of Robert Johnson's recordings: quiet, worried-man blues glowing hesitantly in the dark, shaky, uncertain, spare -- just enough song to keep the devil at bay. Barely at bay, and only for the moment, but for the moment that’s enough.